The Porsche Design Group will launch Porsche Design Sport L'Eau in May. The new fragrance for men is a flanker to 2011's Porsche Design Sport. Porsche Design Sport L'Eau was developed by perfumer Michel Almairac; notes include neroli, bergamot, green accord, mandarin, sandalwood, vanilla and moss. 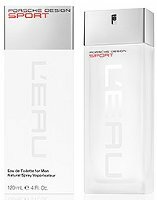 Porsche Design Sport L'Eau will be available in 120 ml Eau de Toilette.